On Friday evening, I went downtown Geneva with several of my colleagues and various people that had attended the event. CERN is right on the France/Switzerland border, so we’ve been going back and forth between the two countries several times a day, often not really knowing what country we were actually in. I had been to Geneva when I was younger, but I really couldn’t say for sure when that was. 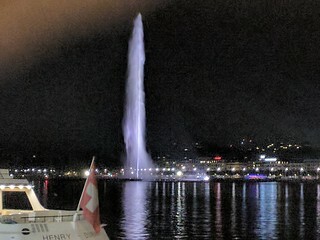 The only thing I remember was the fountain – the Jet D’Eau – so I wanted to see that again. It was every bit as impressive as I remembered it. However, it was the end of a very long day, and between that, and jet lag, I was absolutely exhausted, so headed back to the hotel. I hope to go downtown again for a few hours this afternoon, but I kind of wanted to get these articles written while the memories were fresh. When I was a kid, I dreamed that some day I would have a job traveling around the world, getting paid to see cool things. I think a lot of people dream of that. I have had the amazing good luck to achieve that goal. I have the best coworkers in the world, and I get to do things that I’m passionate about, every single day. The only way that this could be better is if I could have my beloved travel with me. Perhaps some day. 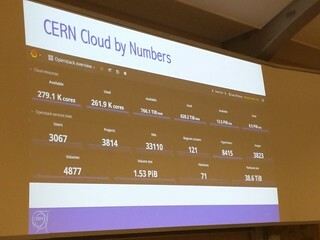 Over the last few days I’ve been in Geneva for the CERN CentOS Dojo, 2017 edition. On Thursday, prior to the main event, a smaller group of CentOS core community got together for some deep-dive discussions around the coming challenges that the project is facing, and constructive ways to address them. This meeting was very potentially productive. I say potentially because some great decisions were made, with universal approval, but everything depends on the execution. Some of these decisions will take a great deal of work over the coming months. Of course, nobody is averse to hard work, but we all also have other things to do. So we need to keep the long-term health of the project firmly in mind, and find time for these tasks. The full notes from that meeting have been posted to the Centos-devel mailing list for further discussion. The attendees were from many different organizations, countries, and cultures. While the various organizations represented have rather different goals and motivations, there was great unity of purpose – ensuring the long-term health of the CentOS project. Topics covered were focused on removing roadblocks to forward movement on the project, and removing obstacles to new contributors to the project coming on board and getting things done. This was very encouraging. Continuing discussion of the topics will happen on the centos-devel mailing list, and, as always, people who want to step up to assist in any of the identified tasks are encouraged to speak up and volunteer. CentOS is a community of project communities, and works best when those projects identify the things that will make them more productive, and then step up to make those things happen.